If you try to use Google Maps UK to get driving directions from London to Nottingham, you will be out of luck. According to Google Maps there is no way to get from one city to the next. Try it, go to Google Maps, click on driving directions, enter in London to Nottingham and click go. 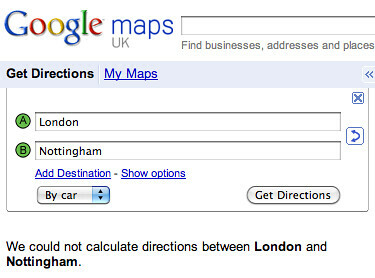 You will be presented with an error that reads, "We could not calculate directions between London and Nottingham." I've also been able to reproduce the problem and have escalated the issue to the proper folks. Hopefully will get this resolved soon. You can always use Bing or Yahoo Maps, heck or even MapQuest to get driving directions.